From The Yeshiva World, ABC, NBC, the Associated Press, The New York Times, and other outlets. A horrific tragedy struck the Flatbush Jewish community on Saturday, March 21, when seven children in one family were killed in a fire. Fire officials say the fire tore through their Midwood home shortly after midnight, after they had gone to bed, likely caused by a malfunctioning hot plate left on for the Sabbath. The blaze took the lives of three girls and four boys - ages 5 to 16 - and left their mother and another child in critical condition. "Two of the children weren't breathing when they brought them out. The firefighters were running with them down the street on stretchers," a volunteer at the scene told the New York Post. "The mother was covered in soot. It's horrible inside," the volunteer said. 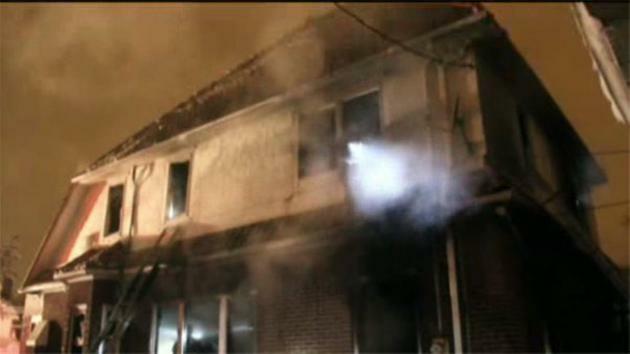 More than 100 firefighters responded and brought the blaze under control at around 1:30 a.m., the FDNY said. Officials said there had not been any working smoke alarms on the first or second floors where the fire spread. At a news conference early Saturday, Fire Commissioner Daniel A. Nigro said a hot plate left on a counter on the first floor malfunctioned, triggering the blaze. "The mother jumped out a front window, a daughter, 15, went out a side window. They both suffered burns and smoke inhalation. The other seven children, ages 5 to 15, died," Nigro said. "This is the largest tragedy by fire that this city has had in seven years," Nigro said. "It's a tragedy for this family, it's a tragedy for this community, it's a tragedy for the city. "This is an unbelievable tragedy," New York Mayor Bill de Blasio told reporters after seeing the devastation at the site of the blaze. "Every New Yorker is feeling this pain right now." De Blasio described the interior of the house, located in Brooklyn's middle-class Midwood neighborhood, as completely charred. “You can literally see what was a home for a large and strong family and now it is wiped out, every room empty and burned,” he said. "This is the largest tragedy by fire that this city has had in seven years"
De Blasio asked for the surrounding community to support the family's grieving father, who was apparently away for a conference overnight. Responding to reports of flames inside the home, firefighters forced their way in and extinguished the fire, which had started in the kitchen, Nigro said. They then found the children, aged 5 to 16, in their bedrooms near the back of the home, he said, after the mother and another daughter jumped. "I heard the mother yelling, 'My kids are in there! My kids are in there! Get them out! Get them out!'" neighbor Nate Weber told the New York Daily News. "The mother was outside. She was burned." Police have identified the children who died as Yaakob Sassoon, 5, Sara, 6, Moshe, 8, Yeshua, 10, Rivkah, 11, David, 12, and Eliane, 16. An FDNY spokesman said a total of 25 fire engines and other units were dispatched to the scene. The Orthodox Jewish community in Midwood where seven siblings died in a house fire during the Sabbath was reeling Sunday as funeral services for the children were being prepared. "I call this not a tragedy but an absolute disaster," said state Assemblyman Dov Hikind, who represents the Brooklyn neighborhood of Midwood where the fire broke out early Saturday. The blaze killed three girls and four boys ages 5 to 16, leaving their mother and another child critically injured. "Everyone's in utter shock," Hikind said. Funeral plans were set for 2 p.m. Sunday at 14th Avenue and 39th Street in Borough Park. Investigators believe a hot plate left on a kitchen counter set off the blaze that sent flames up the stairs, trapping the children in their second-floor bedrooms as they slept. Authorities identified the Sasoon family victims as girls Eliane, 16; Rivkah, 11; and Sara, 6; and boys David, 12; Yeshua, 10; Moshe, 8; and Yaakob, 5. "They were beautiful little children," said a tearful neighbor Rose Insel, remembering how she rewarded the kids with lollipops after voluntarily shoveling her walk. "It's unbelievable. It doesn't seem possible." Another neighbor, Agit Abeckaser, called them an "amazing family." "It's very hard," she said as her husband prayed for the Sasoons at a nearby synagogue Saturday night. Fire Commissioner Daniel Nigro called it the city's worst fatal fire in recent memory and Mayor Bill de Blasio, after touring the charred home, called the blaze a tragedy for the family, the community and the city. A neighbor, Karen Rosenblatt, said she called 911 after seeing flames and smoke bellowing from the home. Her husband said he heard "what seemed like a young girl scream, 'Help me! Help me!'" she said. Firefighters arrived less than four minutes after the 911 call and discovered the badly burned and distraught mother pleading for help. When they broke in the door, firefighters encountered a hopeless situation — a raging fire that had already spread through the kitchen, dining room, common hall, stairway leading upstairs and the rear bedrooms. The last residential blaze with a similar death toll happened in 2007, when eight children and an adult were killed in a fire in a 100-year-old building in the Bronx where several African immigrant families lived. Fire officials said an overheated space heater cord sparked that blaze.